Built with solid ash framework, side panels and legs beneath thick tabletop with MDF core. 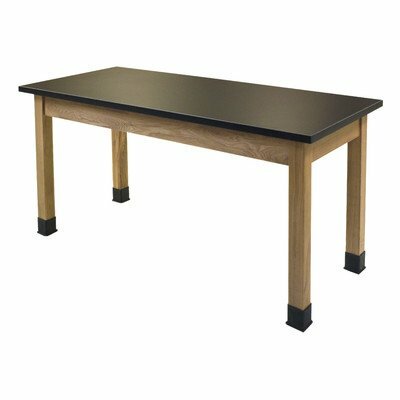 Work surface is solid black, firmly secured, high-pressure laminate, resistant to water and 13 commonly-used laboratory chemicals. Robust legs are spot-welded to frame. Metal-on-metal double-bolts on 13-gauge steel corner braces. Feet are outfitted with rubber liquid-protective boots and adjustable glides for accurate floor leveling. Black seat and back. MAS Green and Sitting Green Certification. ANSI and BIFMA standards. Warranty: 10 years. Assembly Instructions. The NPS SLT Science Lab Tables have "perfect chemistry" with any science classroom.